Q How do I choose the right length of ramp? A. It is better to choose the longest ramp possible that suits the space it needs to fit into , your ability to lift /store/move it & within the budget you want to spend. This will produce a lesser gradient and makes it easier and safer for the wheelchair or scooter to self propel or to be assisted. As an example, a 2m long ramp might give the desired gradient, but do you have enough room to use a two metre ramp when you factor in the 1m or so turning space required to access the bottom of the ramp to start your ascent? 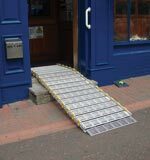 For portable ramps providing assisted access a ramp 6-8 times the height will provide for comfortable access generally ie average weight user being pushed by average strength person. For powerchair / scooter access 8 times the height is normal. Q Are there any regulations that give the gradient to be achieved? A. There are regulations that give guidelines for permanent ramp gradients which is normally 1:15 ie 15inches of ramp for every inch of rise. While they are a useful benchmark this recommended gradient is nearly always totally impractical with a portable ramp. 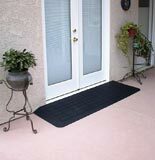 To apply 1:15 to a portable ramp would be counter to the main benefits of a portable ramp i.e. the ability to lift it , store it and move it within the often limited space available. A proper risk assessment by a healthcare professional should be sufficient to decide if a portable ramp is suitable and safe in a particular situation, but inability to achieve a particular gradient should not be a bar to using a portable ramp. For example 1:15 may be the desired permanent ramp gradient, but maybe for a portable/temporary ramp you can only achieve 1:6 because of space restrictions. Is the client safe and happy with 1:6? With care, and an able assistant, a 1:6 gradient or a 9.6 degree angle is safe. Q What type of ramp should I buy? A. The better option is always to choose a single width ramp. 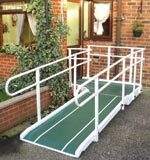 They are heavier than channel ramps but the user / carer can move up/down them without having to align wheels or feet with 2 channels. If lightness is the main consideration then channel ramps should be considered. A recent option are split folding channel ramps which have no central kerbs so can be pushed together to form a single piece ramp but pull apart to leave 2 channels which can then be folded in half. Q Which ramps are suitable for getting scooters into cars, and if so which one do I need? A. Steeper gradients are fine for loading unladen scooters and powerchairs into vehicles. 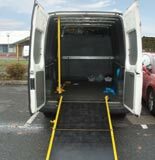 6-8ft long ramps will cater for most vehicles. Lower ride height scooters for example will always need a longer ramp to avoid the risk of grounding at the top of the ramp. 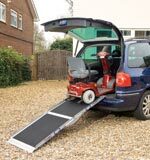 As with house ramps a single width ramp is better but you will need a ramp that folds lengthwise for storage in the vehicle. 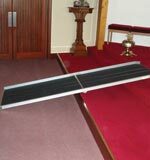 Split folding channel ramps are also a good lightweight option.